Vented height safety helmet features unique chinstrap buckle with variable fastening power allowing wearers to be fully compliant in complex environments containing different, changing hazards. 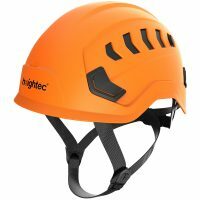 The first height safety helmet to fully conform to European Standard requirements for industrial and climbing situations. 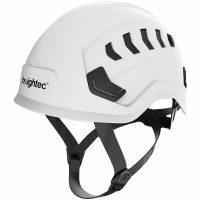 DUON Air™ vented height safety helmet is a high specification helmet with dual certification, meeting both industrial and climbing standards. 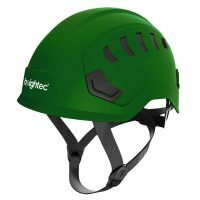 It is the first height safety helmet to meet all of the technical requirements for working at height and confined space. DUON helmets have a unique chinstrap buckle (see below) which can be switched between ‘strong’ and ‘weak’ to give conformity with either standard, allowing wearers to be fully compliant in complex environments containing different, changing hazards. DUON is the only helmet that has full compliance with two European standards, EN 397 and EN 12492, having a special chin strap buckle with a variable fastening power and variable venting. The DUON-Air vented helmet version has vents that can be switched to give conformity with either standard. All switching is carried out without tools. Industrial safety helmets are designed to protect not only the upper part of a wearer’s head but also to provide lateral protection. Advanced cradle design enables optimum comfort and sized to fit between 52cm to 66cm. The DUON has been successfully tested following accelerated UV exposure (the equivalent of 25 years in Northern Europe or 10 years anywhere in the world including Saudi Arabia). This was based on 40 hours per week average exposure. The DUON’s maximum lifespan has been increased to 10 years use. Previously this was limited to 5 years use and 5 years storage (a total of 10 years). EN397 (‘industrial’) has a weak chinstrap to prevent injury if the helmet becomes trapped in machinery etc. and small vents to prevent items such as sparks hitting the wearer. 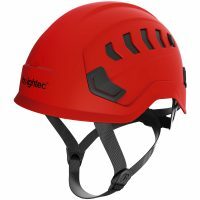 EN12492 (‘mountaineering’) has a strong chinstrap so the helmet stays in place in a fall – protecting the head, and large vents to help prevent workers getting too hot – an occupational health improvement. Patented GB 2 531 146.